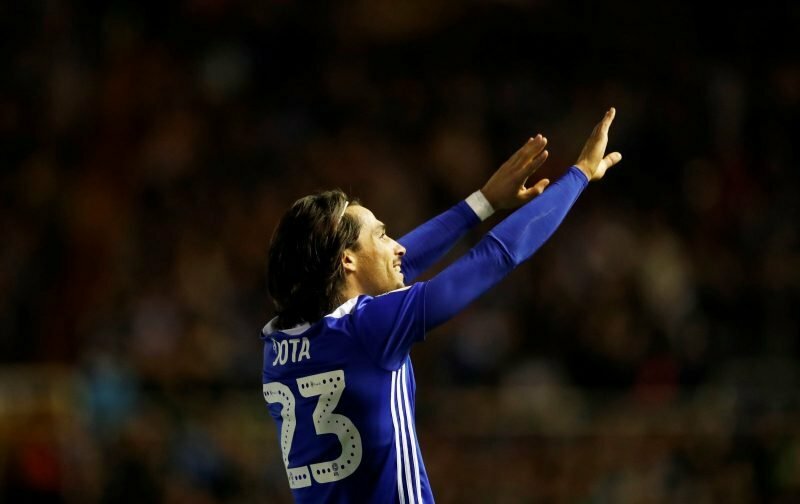 Interesting comments from Jota in his bcfc.com interview. While he doesn’t name names, I think most fans can hazard a guess as to who he is alluding to, *cough* Steve Cotterill *cough*. The Steve Cotterill era was one that won’t go down too fondly with Blues fans. While there were certain restrictions for him in the managerial role, he just didn’t seem to know how to get the best out the players he had at his disposal and there seemed to be a disconnect between him, the players and also the fans. Thankfully in March, that era drew to a close. Up stepped Garry Monk who managed to steer us to survival, when, for the second season in a row, League One looked a possibility. And ironically, Monk got the team playing in a way that Cotterill had publicly said wasn’t possible. Jota’s comments about Cotterill are unsurprising. The 27-year-old joined Blues from Brentford on deadline day last year under Harry Redknapp, but with Redknapp getting sacked as Blues boss midway through September, Jota spent the majority of the season under the management of Steve Cotterill. Jota joined Blues for a record fee in excess of £6 million. He averaged a goal every three games at Brentford, where he played on the wing, and he was known to be a quality creative force for a Brentford team that was consistently challenging for play-off places while he was there. Under Cotterill, Jota looked restricted. He looked void of confidence and unable to produce the kind of form that Blues had seen or heard about from his days at Brentford. Seeing Jota’s comments about his time under Cotterill, it’s unsurprising and totally understandable. He did look like a player who was unsure of his role and that clearly affected him. After Cotterill’s departure and the appointment of Garry Monk, instantly you could see a change in Jota’s play. He scored three of his five goals of last season in the last two months of the season when Monk was in charge. He was starting to show glimpses of the Jota we initially believed would be good value for the £6 million fee paid for him. He was starting to take players on more, create chances and was a key part of Monk’s team that eventually battled to survival. “Since the new gaffer has come I am really happy. I know they have a lot of confidence in me, giving confidence is important for me. I think all the people are happy with me. “Since the start of the season I have tried to work hard, be very focused listen to the gaffer, so that I can try to help the team the maximum on and off the pitch. It’s clear to see Jota is playing with more confidence under Monk. Jota is the type player Monk has favoured at his previous clubs and I think he is finding a really nice balance with allowing Jota to have more creative freedom without it affecting the rugged style and shape of the team. I think Jota is also reaping the benefits of having Maxime Colin behind him, who he struck a strong right-sided partnership with at Brentford. Colin has had an excellent start to the season and just seems to know exactly what to do to allow Jota to make the attacking movements he wants to make. We have seen Jota come inside a lot more which is where he tends to thrive and Colin always seems to be there to give him the support he needs. On the flip side as well, we have seen Jota support Colin well with the defensive duties. Jota has shown a strong work rate this season and with the way this Birmingham City team play, it’s great having players that can give you quality going forward and aren’t afraid to work hard to support the defensive side of the game either. Have we seen the best from Jota yet? No. And he clearly knows that from his own comments. We’re still one of the lowest scoring teams in the division. However, I do believe there is an overreliance on him and other forward players. As co-editor Ryan said in his piece last week, since Maxime Colin’s late consolation at Cardiff City in Garry Monk’s second game in charge, Blues have scored 18 goals and not one has come without the input of that front four. At Brentford, this overreliance was never there and it enabled him to flourish. I think to a degree there needs to be the same at Blues. Yes, there’s always going to be an expectation, but let us not put too much pressure on him to deliver the goods just yet. Especially after the season we had last campaign. Right now, we’re seeing a lot of positives. His performances have been strong, he is showing an increased level of confidence and he is showing glimpses of the quality we know he possesses. Last week’s result will do the team the world of good, so hopefully, he and the team can kick on from here and make this season a strong one. Jota owes the club a great deal. Yes,he is playing better and looks more ‘interested ‘.What he needs to portray is the real energy and willingness to run through a brick wall for the shirt he wears. Keifenbeld is the perfect example. Tomorrow is the ideal game for him as Ipswich will not shackle his skills by thuggish attention.What he will need is plenty of enthusiasm and the desire to up his game to a new level.